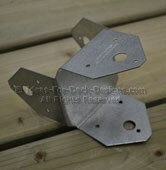 If you are planning to build a wood deck then you are certain to need a few basic but important connectors. The most obvious are joist connectors but there are more. Post and beam connections are perhaps the most fundamental of all wood structures so be sure to use something that is reliable. Yes, with a lot of building experience and knowledge you can build a deck in such a way that the need for structural connectors is minimized. The construction connectors available today make your job go faster and much easier than ever before. Everything rests on the carrier beams and the load is transferred down the post to the footing. So it is critical that the post and beam connection never fail. This is a post cap connector for a smaller 4x4 post. It sits on the top of the support post like a cap. But its U shaped sides cradle a 3.5" wide beam usually made from two 2x pieces of lumber with a 1/2" spacer between. This is perhaps the fastest and easiest way to secure beams to 4x4 post. The load is on top of the post, not bolted sideways where all the load is held by carriage bolts. This kind of connector is less important once you get into the 6x6 post size because you can notch a rabbet cut out of the top of the post. This allows you to rest a double laminated beam on the notch. Then you connect the post and beam using 1/2" carriage bolts. The beaufy of this method is you are resting the load downward on the post because of the notch and you are using a very strong carriage bolt system to hold the beam and post together. In that unique case, there is no risk of the joist ripping free from the rim joist because of the differing load path. But many ledger connections do require the rim joist and other joists to work together to distribute the load from the deck to that connection. You absolutely need good framing connectors in that case. 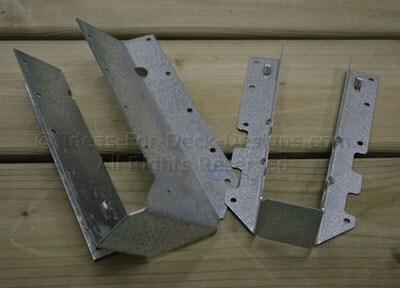 And as you can see here there are a variety of angles and sizes to help you get the job done right. Make sure you use a structural connector with a good coating of zinc and that the nails or screws are able to be used safely in corrisive ACQ treated lumber. Stainless steel is available for very expensive and only really needed in salt air coastal environments. There are many manufacturers and a growing selection of almost any structural connector you an imagine. 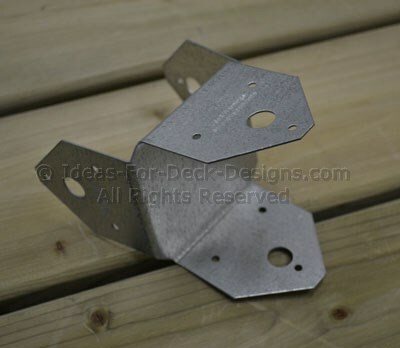 It's simple enough to do so be sure to incorporate these kinds of connectors when you are planning and building your deck.